I’ve commented to friends once too often that I am deeply grateful that social media and camera phones weren’t a thing when I was in college. One was required to wait at least a full day to get visual confirmation of any crazy, youthful hijinks, and that was only if you were the lucky one to receive one of the free doubles that your friend received in her packet of prints. While I mostly can kid about such things, I can’t say that I’ve lived every day in my life in a way that makes me proud. I think there are episodes, nay, entire seasons of my life that would yield actions, words, intentions and truths which make me, today, as I write this even, shameful and shame-filled. There are moments each and every day when there is a divide between what I know I should do or say, and what I actually do or say. Some days these lurk in my darker moments, rearing their head when I’m hungry, angry, lonely or tired. Ahh. The ever-present, watchful, observant, everlasting-memory-when-it-comes-to-my-personal-gaffes preschooler. I don’t think I’m alone in the quest to resemble a responsible, generally good adult human being in my public life most of the time. But there are those episodes and seasons and moments which I would prefer to remain in the dark shadows – those moments when I have not and am not the person I would like my children to know I have been. Saint Photini is also known as the Samaritan woman by the well, from John 4:4-42. It’s a story only told in the Gospel of John, and the longest exchange between Jesus and any woman in scripture. Much of the primary impetus of the story is about who she is and why Jesus shouldn’t be speaking to her. She’s a Samaritan (an enemy of the Jews). She’s a woman who has a past, if you know what I mean. And to top it off, they are at a well, if you know what I mean (if you don’t, wells were a great place to pick up a spouse to be). He asks for a drink; she is surprised he talks to her. He speaks of living water which will never run dry, and her curiosity is piqued. He names all of her history and instead of flinching, she acknowledges his divine ability. She tells him she awaits the Messiah, and he tells her the Messiah is there, speaking to her. And that is enough. None of the disciples speak to her, and she leaves her water jar behind at the well as she heads into the city to tell others about the Messiah. Her witness is that ‘He has told me everything I have ever done,” and they – the Samaritans – flock to hear him. The scripture ends there, but tradition, especially Orthodox tradition, says that Saint Photini converted her sisters and sons, and they traveled to Rome to continue their witness. Because of the power of their faith and conviction, they are each put to torture by Nero. And Photini, she is finally killed by being thrown down an empty well. Violent, but poetically fitting, no? In scripture, the woman is never named, and so tradition gives her the name Photini – the luminous one, light. Orthodox tradition also names her as ‘equal to the apostles’ in her faithfulness and witness. There are so many aspects to Saint Photinai’s interaction with Jesus that a quick search yields more than enough fodder for several blog posts. She is a striking image of someone who not only hears the Good News, but acts on it. 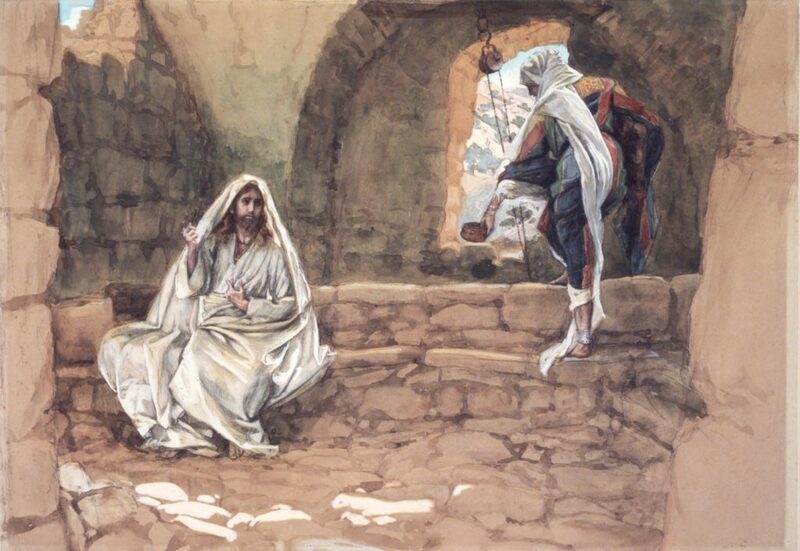 She engages Jesus, prodding him, listening, questioning him. She is never passive, always engaged. She receives the first pronouncement of the Spirit. But what struck me deeply was her assigned name: light. The woman with the storied past is named ‘light.’ Her response to Jesus knowing all about her is not to flinch or to defend or to explain. Her response is to know him better, too. There is no judgment on Jesus’ part towards her. He knows all about her, and she, in return, wishes to know all about him. Her past isn’t stopping her from recognizing the divine. In fact, it is to a woman with a past that Jesus reveals who he is, and who he is to be. I’d love my children to think of me as a quasi-saint, blameless and practically perfect in every way. But that is far from the truth. I’ve made mistakes. Some of them I have apologized or atoned for. Some still lurk. And I trust that Jesus knows the stories I carry with me. I also trust that Jesus will know the stories my children, my beloveds, will carry some day too, for they are not perfect either. And Jesus will love them. And they will be conduits of faith—light dispelling the darkness again and again. When they get older I will tell them some of these stories. I will be (again) grateful that they aren’t etched on Facebook or Insta somewhere. But I will also tell them that they are not the entire story and sum of me, or of any person. Their stories will never be the sum and total of them. The light of Christ was reflected in Saint Photini, and perhaps it can be reflected in my life, too. It’s a beautiful story and one to which I can relate. I too was the Woman at the well. I too had a shady past. I too was looking for answers when I found Jesus. I need to know the good news when I finally received it. I am no longer the person I once was. I am on an awesome recovery path in which I talk to my Lord and Savior every day. Thank you Jesus for saving me and molding me into the person that you will me to be today .